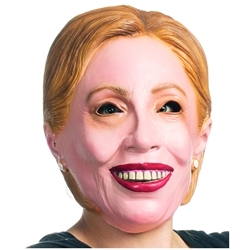 Full over the hood latex Hillary Clinton Mask. Perfect for Halloween or political satire. Hillary Clinton is the Democratic Party's nomination for President of the United States in 2016. This mask is designed based on her looks. For a more comfortable fit it is recommended that you wear a nylon hood underneath the mask. Don’t forget a Styrofoam head for properly storing and displaying your mask.